Bitcoin may be the most well-known cryptocurrency, being the example that most illustrates a virtual coin. However, Bitcoin is one of many cryptocurrencies and in recent years, ‘alternate coins’ (Altcoins) have been making gains in the peer to peer, decentralised and anonymous currency market. 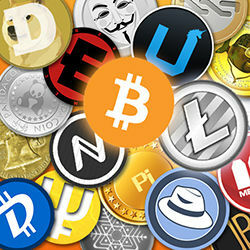 Many of the Altcoins a built upon the fundamentals and framework provided by Bitcoin, with different coins aiming to provide a different and unique selling point, using Bitcoin’s technology for a unique application like, for example, some coins’ ability to use Smart contracts; software designed to enforce contracts automatically and without error. Introduced in October 2011, Litecoin can be seen as ‘the silver to Bitcoin’s gold,’ and a close competitor to Bitcoin, with 21 million total Bitcoin in existence and 84 million Litecoin. Based upon Bitcoin’s blockchain and protocol, Litecoin is an open-source software project that uses some improved mechanics from Bitcoin to conduct peer to peer payments. This overcomes the limitation to transactions by the size of the blockchain (limited by the blocks, 1 megabyte in size), as only a certain number of transactions can be added to a block. SegWit attempts to ignore data attached to a blockchain signature and instead move it towards the end of transaction. This means more can be stored on a block, allowing for a greater number of transactions within a given time – an advantage over Bitcoin, which has experienced bottlenecks in the past. A lower memory requirement also allows for effective mining of the currency on consumer-grade computers, bringing the coin to a more accessible format. It was seen as the next best thing to Bitcoin, until Ethereum grew in 2017. This currency has been making headlines recently, and for good reason. Predicated on being much more than a currency, the digital platform utilises a blockchain that is oriented around facilitating other applications, essentially a programming language if you will. The central innovation, Ethereum Virtual Machine (EVM) makes this possible, enabling the use of smart contracts as well as a currency exchange. These ‘dapps,’ decentralised applications, enable Ethereum to be more versatile than Bitcoin, with Ether (the coin) being used to pay for services, fees or as a currency itself. Due to its applications, Ethereum has more avenues for growth, with the more developers using the EVM, the more the currency will be worth and the more services that can be offered, meaning it could become self-contained. An August 2012 entrant, it is an inflationary currency due to the lack of upper limit to the amount of coins. Peercoin currently uses a Proof of work system, requiring miners to verify transactions but the platform sought a proof of stake system, one that will increase the chance of mining coins as more coins come into possession. This means that the process of mining is smoother than Bitcoin, since it is more predictable because the rewards that miners receive change gradually, rather than in large steps. Receiving some support from Alibaba, the new smart contract code platform aims to support decentralised commerce and the digitisation of many assets. At a conference at the Microsoft headquarters in Beijing (circa June 22nd 2017), Da Hongfei, the founder of NEO, revealed that the platform is working with Chinese authorities to map real-world assets using the smart contract system, building from the success the platform received when collaborating with start-up partners, including Bancor, Coindash and Binance. Whilst Ethereum requires the developers to learn the new language, NEO seeks to use any language, greatly increasing the accessibility for companies and users to utilise smart contracts. Using common programming languages, the platform can compete with Ethereum for smart contract usage. Once it sees success with mainstream Chinese companies, perhaps western markets may see applications for the cryptocurrency’s usage. A digital token that is part of project to improve our experiences with the existing internet. The project aims to use idle computing power on existing devices, from computers to smartphones, to help speed up processing, software performance and speed on other devices. The devices that are idle are used for their spare power, putting the performance in the hands of someone who can use it. Akin to the stock market, you invest money with a company that can use the capital. Idle device owners are paid in Golem Network Tokens. The network aims to connect machines around the globe and harness idle computing power. The tokens are traded on Ethereum through smart contracts. This project has some promise, perhaps moving the internet to a more fluid state, allowing individuals to truly access the full potential of their devices, whilst helping others in the process. The applications for cyber security are also interesting, for example DDoS attacks (mass influx of requests to connect to a company’s servers overloads them, similar to a restaurant receiving too many guests) could be stunted since a company under attack could tap into this network and strengthen its reserves. Born on the 26th June 2017, EOS is one of the youngest currencies currently available. Whilst it is still a concept without a functioning project as of yet, its prices are rising. Similar to Ethereum’s aim, EOS’ objective is to facilitate decentralised applications, but differentiating itself on the level of technical ability needed to develop ‘dapps.’ Until a service is delivered and the system is seen to be working, Ethereum is safe. An open blockchain platform, extending the functionalities of Bitcoin, seeking to maximise the effectiveness of currency exchanges, alongside providing crowdfunding solutions. Waves also seeks to be an anti-money laundering platform, setting it up for strategic partnerships, in both the cybersecurity and banking arena. Recently, ‘Big Four’ Deloitte CIS and Russian blockchainsolutions firm Waves have partnered up to provide, ‘comprehensive ICO services’. Waves is keen to exploit this strategic partnership to shape the crypto-regulatory world and serves to show that there is potential for cryptocurrency icons to reshape the legislative environment in their image. The system allows for the ‘creation, issuance, transfer and Exchange of assets and custom tokens,’ simultaneously allowing for the transfer of fiat tokens, trading fiat over blockchain without any volatility. The system also provides a portfolio to easily keep track of assets. The recent rise in ICOs, alongside continued growth in the cryptosphere has enabled more currencies to rise, creating more room for opportunity. The breakthrough fostered by Bitcoin has undoubtedly bloomed into something exciting. Whether or not the up and coming projects will continue to go from strength to strength in light of plans for regulation is yet to be seen. How decentralised systems will continue to work once regulation is in place is another difficult question. For now, the Altcoins provide unique applications and a different texture from ‘mainstream’ Bitcoin.